I'm getting the itch to shoot the service rifles again. Don't know if it's because I've been hanging around here for a couple of weeks or if I'm here because I already had the itch. Been digging thru the expended brass museum and found about 500 LC87 Match cases. It has been fired four times. Back when I was shooting a lot I never heard of the paper clip test. Instead I kept track of the number of times a lot of brass had been fired, When it got up to four I stopped using it. Four seemed to be the red line for most of the shooters I hung around with. I dusted off this 4X LC87 Match stuff and tried the paper clip test. Wanted to find 200 cases without incipient head separation. End result was in process of finding 200 good cases I found 40 that failed the paper clip (two of these were cracked). So after being fired 4 times in an M1A the number of failures was 40/240 = 17%. I'm going to load the ones that passed the test and give them a try. If no surprises I'll paper clip sort the rest of the old brass I have on hand. Maybe I ought to find my broken shell extractor and take it along. Good idea on taking a broken shell extractor with you for sure. When I was using actual NATO diameter chambered rifles " USGI or Chinese barrels 4 loads and I wouldn't even look at the cases again. Since I am now using SAMMI diameter .308 chambers that are headspaced to NATO I have been able to go to 8 loading with no problems. Looking forward to your report. What is the "paper clip test"? I've been reloading for years and never heard this term. Wow - eight reloads. When I started out I was dumber than a box of rocks and kept reloading and shooting until the bright ring showed up or I had a separation. Eventually I segregated the brass by head stamp and number of times fired and retired it after four firings. My competition was all with commercial barrels. I never asked what chamber reamers were used. Don't know if they were 7.62 or .308. This LC87 Match brass was leg match stuff that went thru my M1A. Of course when picking up brass in a match you always lose a few and gain a few that went thru a different rifle. I plan to mount a scope on one of the rifles and intend to use this ammo to get it dialed in. I will report the results. 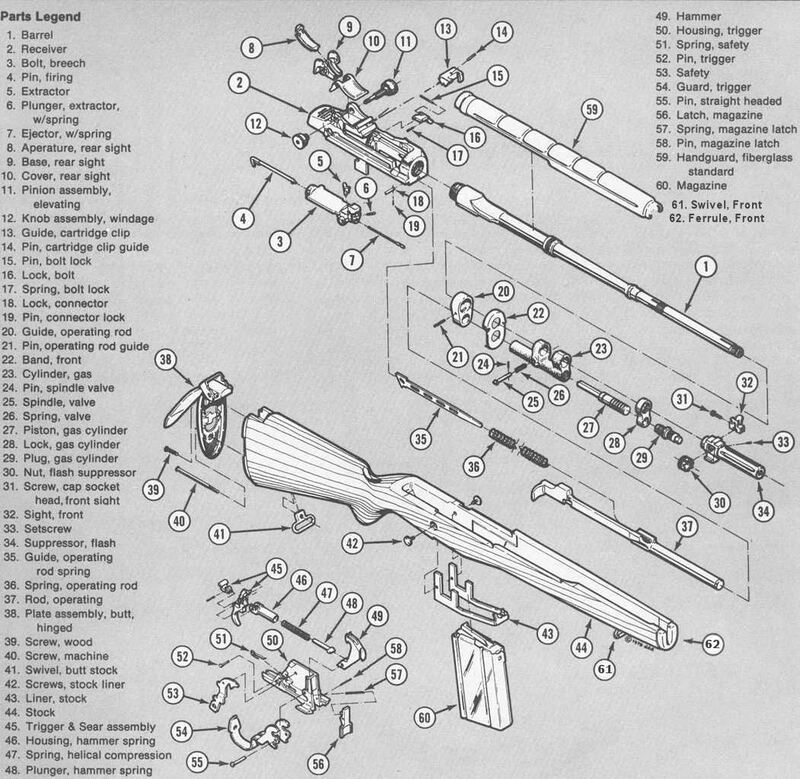 In case you are not familiar with the problem of reloading, especially for the M14/M1A, the cartridge case stretches each time it's fired. Much of this happens about 1/2" forward of the rim where the thick base tapers down to the thin walls. If reloaded too many times when the action cycles the lower 1/2" of the case will be torn off by the bolt and extracted & ejected leaving the forward part of the case in the chamber. The stretching seems to be a gradual process with repeated reloadings. As it stretches a groove develops inside the case where thick web at the base transitions to the case wall. At first it is smooth and shallow but becomes deeper and sharper the more the case is fired. If fired enough times a so called "bright ring" can be seen on the outside of the case. Next step after the "bright ring" is either a crack all the way thru the case wall but only part way around the circumference or a full case head separation when fired. The paper clip test as I understand it: (1) Straighten out a large paper clip or other type of stiff wire. (2) Make a 90° bend on one end short enough to enter case mouth. (3) Sharpening the point of the bend can help. (4) Insert the wire into the mouth of the case so it bottoms out against the web. (5) Drag the point back and forth across the inside of the case from the base about 3/4" towards the mouth. Do this in a few areas around the inside. (6) If a crack has started it will be sharp and the tip of the wire may catch in it. If a lot of stretch has occurred you'll feel a smooth but deep depression. If the stretch has just started you will feel a smooth shallow valley - this is subtle. This test is based on feel and is hard to describe. To me the beginning stage is pretty subtle. If the case is ready to separate it will be obvious. If you have any brass that has been fired multiple times and some have the "bright ring" that would be a good place to experiment. Compare these to once fired brass which will be smooth on the inside. Last edited by NMC_EXP; 27th February 2019 at 02:39 PM. The risk of head separations was just one of the problems I used to fear after 4 firings in an M1A. The heads of the cases were generally really chewed up. I put my M1A in the back of the safe about the time I learned of RCBS X-Dies. They limit case length growth after the first sizing/trimming. I always intended to see if they helped .308 cases to last longer. You might want to try them and see if they help. I. Paper clip test on a 2nd batch of 4X fired LC87 Match cases: Of 121 tested 21 failed = 21/121 = 17% incipient head separation. This is the same fail rate as the first batch from this lot. II. I prepped and loaded a bunch of the 4X fired brass that passed the test. All were resized to 0.00" on a micrometer headspace gage. All were trimmed to 2.005". SMK 168 with the usual charge of IMR4895. III. Fired 21 in an M1A with a SAK GI NM barrel - this is the 5th time fired for this brass. Did the PC test, 7 of 21 failed = 33% failure rate. Note: One of these cases cracked thru 3/4's of the way around but did not separate. IV. Fired 17 in a Remington 40X match rifle. PC test = 2 bad of 17 = 12%. Not a lot of data but out of an M1A the jump from 17% failed after 4 firings to 33% failed after 5 firings seems significant. Should be noted that the first 4 cycles were out of a commercial chamber and barrel. The 5th was a GI NM chamber. This GI chamber blows them from 0.000 out to +0.008. In my commercial M1A chambers they typically went to +0.005. Last edited by NMC_EXP; 12th March 2019 at 10:58 PM. I have learned to be ' picky-picky'. I now have a Lyman Bore cam (tool). Wow ! you can really see the spot where the bent paper clip sticks..and the smooth spot, too. This is a slow endeavor but, I got time. I have made some picks from hobby store - model airplane piano wire- .015" epoxied into a small dowel stick. = does not bend & a lil flex upon forcing against the case wall. If you know somebody with the Lyman bore cam, get to 'take a look-see' . Sorry.for no picture supplied here. out. On the old site a member had done an extensive review on the XDIE system years ago. He must have been an engineer. When I was reloading for the platform I used the XDIE and it did limit case growing. You all can go to hell, I'm goin to Texas.